All work and no play makes a dull workplace. When we talk about dream companies, Google or Facebook are often naturally at the top of our minds — which is not surprising, since they have been consistently ranked high as some of the best companies to work for. Singapore Airlines (SIA) was named the world’s best airline in 2018 – it’s fourth win since 2004. The nation’s flagship carrier was also recently listed as the top 50 ‘Genius Companies’ in 2018 by TIME magazine, alongside other luminaries such as Apple, Nike, Disney and Nintendo. For such an established company, it’s definitely no surprise that they offer great staff benefits. SIA employees are entitled to free flight tickets for themselves and their eligible dependants (eg. wife/husband, kids, parents) once a year to any SIA destination. In addition, they can choose to travel on up to 90% discounted flight tickets for themselves and their eligible dependants. All staff are also eligible to to a free upgrade to Premium Economy class (up to Business and First Class for some), depending on the space availability. Moreover, once an employee accumulates 25 years of service and retires from the company, they’ll be eligible for lifetime travel benefits! The SIA Group Sports Club located next to the SIA Training Centre offers a wide range of sports facilities, from soccer, badminton, tennis, squash, table tennis and basketball, to a swimming pool and gym. This is part of the company’s efforts to promote health and fitness amongst its employees, and to provide a venue to unwind after work or over the weekends. Carousell was named one of the best tech companies to work for in Singapore in 2017 for its innovative practices and awesome workplace culture. Early last year, the company had relocated its office from tech startup hub Blk71 to the CBD district to accommodate their fast-growing team. We had the chance to check out their new two-storey office and we were definitely impressed that they have an in-house barista that serves free coffee for the staff! 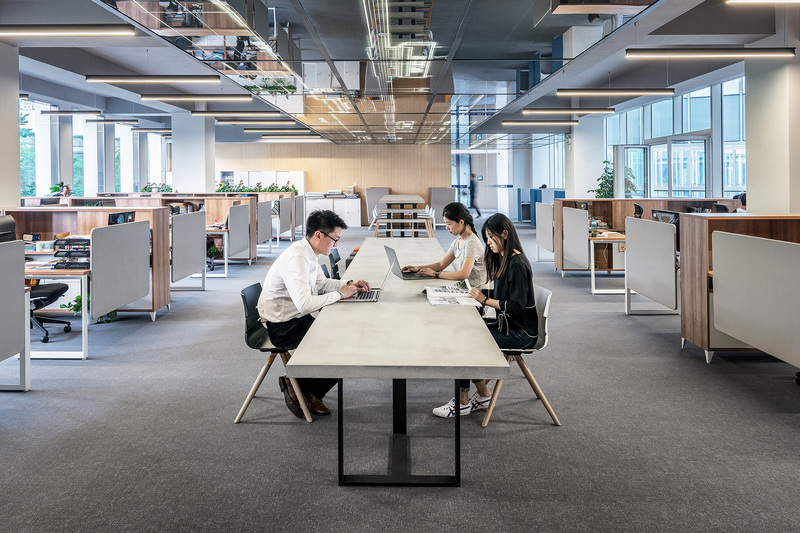 Their dog-friendly office also have dedicated lounge, entertainment and gaming areas for employees to chill and interact with their colleagues in a collaborative space. Carousellers are free to swing by the games area and play a round of pool, ping-pong, or PlayStation anytime during working hours — as long as they make sure their work gets done! There’s also free catered lunches every Friday so everyone in the Carousell family can share a meal together and and have the chance to bond over meals. In addition, Carousell has a flexi-work programme that lets full-time employees work from anywhere in the world and live the life of a digital nomad, for up to 5 days (not limited to Carousell’s overseas offices, though that’s recommended). Employees can also earn a chance to travel for free if they earn a CarouStar Awards, which is an internal award to recognise employees who contribute to the company mission and core values. Employees are nominated and voted for, and winners can win a trip to any country with a Carousell office (Malaysia, Indonesia, Taiwan, Hong Kong, and Australia)! Razer is a billion-dollar gaming company which has successfully built a cult following from just a gaming mouse. As a company that lives by its creed ‘for gamers, by gamers’, it comes as no surprise that the recreational area in its Singapore office is reminiscent of a gaming arcade. According to Razer, it’s critical for its employees to be gamers themselves so they can better serve their gamer customers. As such, Razer employees are allowed to game anytime they like, as long as they get their work done. No one will bat an eye if you’re trying to claim ‘chicken dinner’ in PUBG (PlayerUnknown’s Battleground) in the middle of the day! In line with this, all employees are also issued with a Razer Blade as a work laptop! Razer also hosts regular community game nights and internal tournaments where employees can game all night long with their friends and colleagues. To keep up with its employees’ huge gaming appetite, Razer caters free buffet lunch every day for all staff. Razer also makes it a point to bring in external instructors to conduct free fitness classes for the company such as weekly yoga sessions. Goodstuph is an undeniably cool social media agency, which has carved a strong reputation in the local creative scene since it was founded in 2010. With the candid Pat Law (Chief Everything Officer) helming the company, you can definitely expect the woman to serve up quirky employee perks. Goodstuph offers free brazilian waxing, eyebrow trimming and even haircuts for its employees; these grooming benefits can be claimed on a monthly basis. When it comes to food, the company offers free breakfast on Tuesdays, and free-flow artisanal coffee all day! Their office has a La Marzocco coffee machine with beans from Papa Palheta, and employees are welcome to undergo the barista training at Papa’s if they wish. Goodstuph’s office also features a ball pit, which is used to hold a company-wide lucky draw. Every month, Law will scribble a prize on a ball and drop it into the pit. Lucky employees will stand a chance to win prizes ranging from a 1-day off-in-lieu to a $150 massage voucher. TheSmartLocal (TSL) is the biggest lifestyle and travel portal in Singapore, with sister sites Eatbook, Zula, LST Events, and MustShareNews under its umbrella. It moved into a new office space in November 2016, and pretty much converted a bare industrial space into an industrial chic office that spans 7,500 sq ft. Beyond the numerous chill spots around the office, TSL also has an in-house kitchen so employees are free to whip up meals, and then have lunch together at the communal dining area. And their biggest claim to fame about being a ‘mini Google’ office are the dedicated nap area, which lets employees sufficiently rest and recharge after a day of hustling. Moreover, TSL employees tend to stay over till late, even for leisure, so bunk beds are definitely essential in the office! For longer-serving employees, TSL offers a few “special perks” such as working from home, job redesign for those who want to try their hand at something new, and even possibilities for taking sabbaticals. Shopee is an e-commerce platform under Sea group (previously known as Garena), which was first launched in Singapore in 2015. Its new office at Ascent Building features various amenities to pamper their employees with maximum comfort, so they can feel comfortable and at home, even while they’re at work. When employees feel tired, they can enjoy a free rejuvenating massage twice a month by their in-house masseuse. Otherwise, they can escape to the sleeping pods for a quick recharge. Or when employees feel stressed, they can also wind down at the entertainment corner, which is furnished with an air hockey table, a pool table, and a foosball table. For those who prefer to eat their stress away, Shopee has a well-stocked pantry that also hosts free staff breakfast every Monday mornings. Shopee also provides a dinner catering service, where employees can pre-order dinner from a wide range of food options through their intranet. Ministry Of Design (MOD) is an award-winning architecture and design firm headquartered in Singapore, whose notable works include Tangs flagship store, Macalister Mansion, Leo Burnett’s US office, and the New Majestic Hotel. The company is big on striking a work-life balance, so it lets all employees leave work at 3.30pm every Fridays! It believes that this early release will give them more to unwind before the weekend, keeping them happy and more productive. Ministry Of Design also implements birthday leave – employees can take the whole day off if a working day falls on their birthday. In Singapore, employers must provide a bare minimum of seven days of paid leave — a law that has been unchanged since 1968. But local web design firm Fixx Digital chooses to go against the grain and offer its employees unlimited paid leave, an initiative that it has boldly implemented since 2015. Unfortunately, some employees have abused this system, claiming up to 40 days of annual leave, so the company is now offering this perk as an incentive to those who have worked at least a year in the firm and have produced good results. Shouldn’t be hard to achieve though! The company also actively rewards good employees with its ‘Employee of the Month’ award, letting them enjoy up to $100 CapitaLand mall voucher in return for their hard work. Their shared office also features a ‘Cinema Room’, which comes with plush couches, a big-screen television set, and a surround-sound system so employees can Netflix and chill together. Circles.Life has made waves as Singapore’s first virtual mobile telco, which prides itself on fighting data deprivation with its signature 20GB for $20 offering. They’ve also made headlines for its viral marketing campaigns such as the vandalising stint by the Youtiao666 girls and the ‘Pay $3, Get $50’ vending machine, so it’s pretty clear that risk-taking is at the heart of Circles.Life’s DNA. Internally, Circles.Life provides company-wide free lunches every Wednesday. Called ‘Lunch & Learn’, employees are free to share their projects and learning over lunch. There’s also a free team lunch every month, where employees are encouraged to eat out with their teams or across departments to foster bonding. They also host monthly outing activities for all staff — employees can pick and choose what they want to do (eg. paintball), grab colleagues to join in the fun, and everything will be paid for by the company! With Singapore’s burgeoning e-commerce scene, local startup ShopBack is tapping on this trend to popularise cashbacks. Basically, customers can get a percentage of their purchase money back each time they make a transaction through ShopBack’s website. This young company has a school-themed office interior, which is designed by interns who stayed overnight once to decorate everything. All their furniture was assembled by ShopBackers, and their office mural was also hand-painted by their in-house designers. Beyond the fun office space which is equipped with lots of games (ping pong table, foosball table), ShopBack also offers free lunch for its staff every Fridays. It also offers free-flow alcohol during happy hours so employees can skip those after-work bar visits. They also conduct their own weekly fitness sessions such as HIIT and yoga (the latter is conducted by their finance lady who’s a certified yoga practitioner), which takes place after work in the evenings – a perfect activity to let employees destress after a hard day’s work!